Custom Colonial Style Carved Wood Circa Sign - - a carved HDU property name sign made in the Colonial style. Wall mount. Vertical orientation. 18"W x 24"H. Made in USA. The script text and border are carved (engraved) in a prismatic V-shape and painted black. The formal black and white color scheme is well-suited to a sign of this style. This sign holds three lines for the manor name, property name, or other wording you supply plus the Circa (founding) year at the top of the plaque. Please enter the four digit Circa year as shown in the sample sign. Lines 1, 2, and 3 each hold up to seven (7) characters. The accent lines above and below the property name are standard on this plaque. Color: white plaque with black wording, accents, and border. Dimensions: 18"W x 24"H x 1.5" thick. 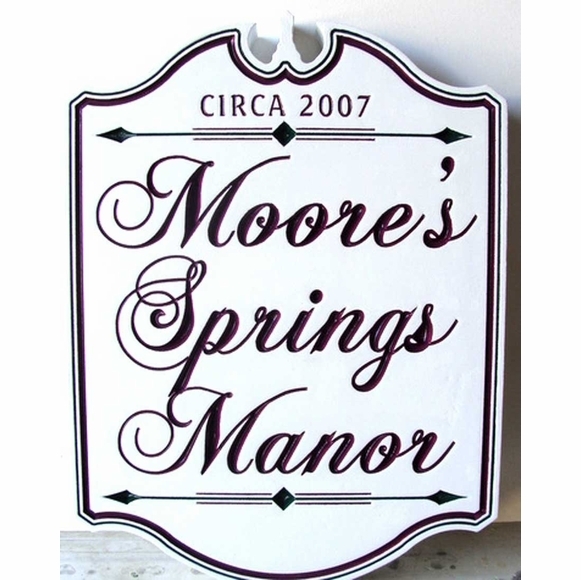 Property name on sample plaque: Moore's Springs Manor.